You tirelessly plan for everything within your power to keep your child safe and happy. You spend countless hours thinking over how to raise your child in an uncertain world. You take days to shop around and research the best crib, stroller, diapers, pediatrician, day care, and kindergarten teacher. Have you thought about how important your relationship is to the happiness and well-being of your child? Whether this is your first child or the youngest of many, come join us for a workshop on how to enhance your relationship to withstand the strains of parenting and enjoy the wealth of your family for a lifetime together. 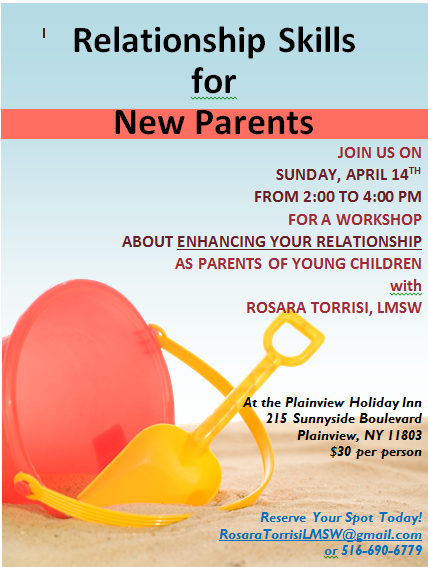 Sunday, April 14th, from 2-4pm at the Plainview Holiday Inn. $30 per person. 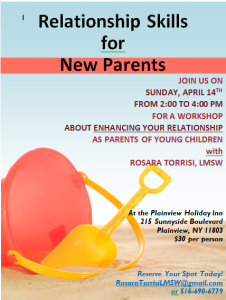 Call 516-690-6779 or e-mail RosaraTorrisiLMSW@gmail.com to RESERVE YOUR SPOT TODAY!